That one thing that you need in your life in order to survive2? It’s more than just something that you like to do. You are so passionate3 about it that you could do it every day for free. Your bliss is absolutely essential to your existence. It is the reason you are here on Earth. It is both your passion4 and your purpose5. It is the source of your happiness, joy, and fulfillment6. Without it you wouldn’t know what to do. It fills you with limitless energy and inspires you to live your best life. As you dive deeper7 and deeper into your bliss, you seem to just lose track of time completely. You even love it so much that you want to share it with everyone that you meet. It could be an outdoor activity or a sport, like hiking, running, climbing, swimming, biking, skiing, soccer, basketball, or volleyball. Or maybe it’s a creative art such as photography, painting, writing, acting, storytelling, cooking, or dance. It could also be a spiritual practice such as prayer, meditation, or yoga. Whatever your bliss is, you should make sure to follow it everyday and seek out opportunities to do it in English. The first step to living your English is to find ways to do the activities that excite8 you and talk with people about why you love these activities, in English, instead of your native language. No matter where you are at in the process of learning English, following your bliss gives you the motivation to wake up each day and take short strides9 toward your goals. If you are just starting out on the journey to RealLife English fluency, it inspires you to do something out of the ordinary10 and step outside of your comfort zone. If you are well along your journey, then maybe it’s the spark11 that you need in order to reignite12 your passion for English. Everyday when you wake up to embark on your quest to conquer English, your bliss is calling you. What are you waiting for? It’s time to take the leap13 and accept the call to adventure! 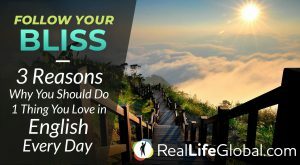 Here are a few reasons why you should follow your bliss when learning English and see where it leads you. When you are following your bliss, you are not just learning English, but living it. You forget that you are even studying the language. Instead of learning in the traditional classroom setting, you can transform the world into your classroom. Do the activities that you already love, but find ways to include English. Naturally, exploring different subjects that interest you in English will give you a reason to keep learning. For example, if you love to travel and meet people in person, you can make it a part of your learning process. You can plan your next trip to a native English speaking country, spend time in hostels, attend language exchanges or English Meetup groups, and host14 travelers that speak English on Couchsurfing or AirBnB. If your passion is food and cooking, you could visit different restaurants around your city and practice your English by writing reviews on Yelp, Facebook, or your own personal food blog. You could even create a YouTube video explaining the steps to a delicious, traditional recipe from your native country. If I had only one more month to live, what would I do? From that list, pick three things that just thinking about them makes you excited and fills you with energy. Now, go do those things in English. See the world like a child again and make learning English a game. In this game, you have the freedom15 to choose and play what you want. Be curious16 and explore where your bliss leads you. There are an endless17 number of possibilities18. Are you already an expert in a particular area in your profession? Do you have a hobby19 that you have been doing for years? Your hobbies and professional skills are likely connected to your bliss. Since you have already mastered your craft in your native language, you might as well follow your bliss and learn how to communicate what you already know in English. There are many benefits that come from mastering specific English vocabulary related to your job and the activities that you do outside of the office. Fortunately, you don’t need to know many words to sound like an expert, but you will need to know how to use and pronounce them correctly. Mastering the vocabulary of academic fields, such as business, law, medicine, engineering, science, math, and programming, allows you to not only communicate your ideas to a broader20 audience, but also learn more. You know longer limit your audience to people in your country. Everything you do will have a bigger impact on the world. You might even get the chance to do research or give a presentation in another country and share your work in English. If you partake21 in interesting hobbies such as playing an instrument, singing, extreme sports like snowboarding or rock climbing, yoga, martial arts, dance, or painting, mastering the specific vocabulary allows you to teach these skills. You could create an online tutorial22 explaining these subjects to people and post them on YouTube or social media. Another option is offering classes for English speaking foreigners23 in your city. This is also a great way to meet people and discover communities that speak English, which leads us to the next point. In order to achieve your English learning goals, you need to surround yourself with people that share your interests and support you along your journey to RealLife English fluency. When you have a dream or vision in your mind and you go after it, you will naturally create a tribe of supportive friends and mentors that will motivate you and help you reach your goals. When you follow your bliss, you become like a magnet26 and attract27 the right people into your life. You can start creating your English learning tribe by facing your fears, practicing your English in public, and openly expressing your goals. The more open and honest you are, the easier it will be to attract others with the same interests. You can meet new people through Meetup groups, language exchanges, professional networking28 events, online language apps, English Facebook groups, and even dating apps like Tinder and Bumble. A more creative and bold29 way to refine your communication skills is by starting a business and offering your services in English. It will help you significantly to meet people that are also looking to advance their English to the next level or willing30 to help you improve. If you are following your bliss while also learning English, these people will quickly turn into your best friends, coaches, and mentors31. Your tribe is like a pride32 of lions in the savanna. Together you can accomplish33 anything. They give you the security to be vulnerable34, share ideas, try new things, make mistakes, and get feedback35. Your tribe is essential to your growth along your journey so it is important to choose wisely36 who you allow into it. Now that you are motivated to return to your English learning journey, it’s time to keep the momentum rolling37. Your bliss is the fire that keeps you going along the journey when you feel discouraged and want to quit. Therefore, remember to do things that you love in English every day. Most importantly, remember WHY you started on this journey in the first place. Follow your bliss and make everyday learning English an awesome adventure. Thanks for reading! Hope you found some good motivational tips in the article! Another awesome article. Thank you, Zach!